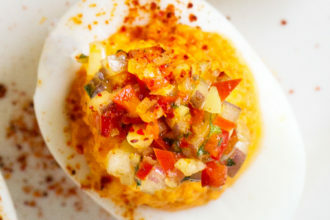 The upscale diner in the reborn downtown hotel serves up delightful 'deviled egg insanity' as a starter. “Everyone says I always make things so hard in the kitchen,” Graham Dodds says. “What could be a simple preparation turns into a multiple-step process. I insist on taking the extra step to make dishes really delicious.” The chef, who is overseeing all of the food and beverages at the recently reborn Statler hotel, opened Overeasy in late October. The upscale diner focuses on comfort food and features an all-day breakfast menu. 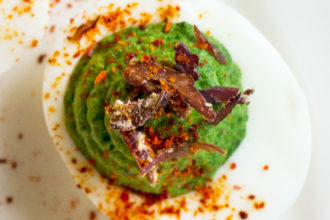 Dodds refers to this ambitious starter as “deviled egg insanity” and jokes that the dish is a “cry for help.” The only help he’s getting from us is with cleaning the plate. Dodds sources his eggs from Double R Ranch in Richland, about an hour southeast of Dallas. 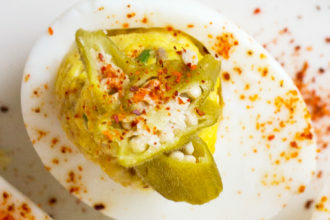 This twist on the staple has house-made aioli, creole grain mustard, white vinegar, a pinch of sugar, and minced cornichons. Carrot purée, egg yolks, aioli, and white vinegar are finished with a dusting of sugar and salt. Parsley, cilantro, garlic, and lemon and lime juice are mixed with jalapeños, shallots, yolks, and aioli. 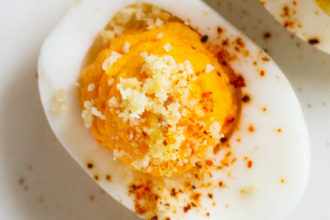 The traditional egg is combined with brisket and a house-made barbecue spice blend. 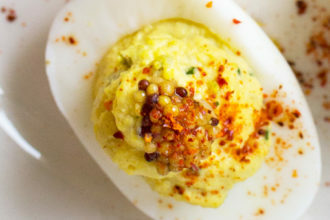 Dodds blends piquillo peppers, shallots, garlic, egg yolks, aioli, and bread crumbs.